It's the first Wednesday of the month, and here's your Marketing Angel Card for May! Today's card is from the Life Purpose Oracle Card deck by Doreen Virtue. 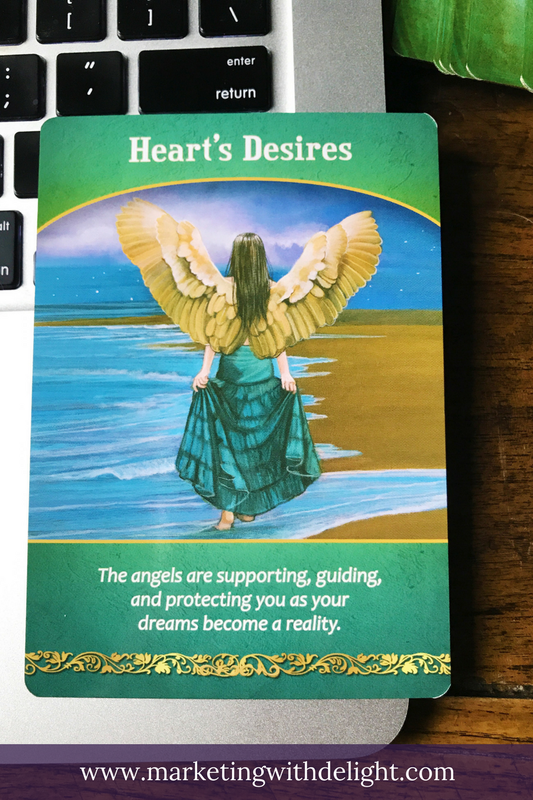 The angels are supporting, guiding and protecting you as your dreams become a reality. I love getting this card today because I've been doing a lot of meditating and getting clear on what I desire. In both my business and my personal life. I read an astrology blog lately and it seems that I'm not the only one who is feeling introspective lately. The energy of the Universe supports this type of reflection right now! So, I invite to take some quiet time and go inside to ask yourself some of these big questions. What is my ideal work day? Is my business fulfilling my heart's desire? What would make my work feel more fun? Do a little journaling and see what comes up! Did you like this Marketing Angel Card Reading? Sign up for email updates and never miss a monthly card reading. Today I decided to mix things up a little. Instead of a blog post about Facebook ads, I decided to do an angel card reading for you! I’ve just been getting the nudge lately to incorporate my intuitive work into my marketing work. So I’m following my inspiration and it’s a lot of fun! I absolutely love getting this card for business and marketing! This is a great month to make a move! Start an FB live show. Play with some Insta stories. Write some personal messages to your dream clients and invite them into your paid programs. Post and network inside a Facebook group where your peeps hang out. The important thing is to get yourself out there and be visible on a new level. And do it in a way that feels fun! It doesn’t have to be stressful or high pressure. Just get curious and try something new in your marketing. This month is your time to put your business out there in a whole new way!